I've colored the image with Copic markers. The gold is from a glitter gel pen. All supplies are from my long-hoarded stash. The little glittered foam piece fit perfectly over the shamrock on the hat! Can you believe that? I thought that was INCREDIBLY LUCKY for me! :) lol The sentiment is from a From the Heart Stamps set called Hamlet PigWit Think Spring. The "ribbon" I used has a funny story behind it. I purchased this about two years ago from Joann's Crafts. I was looking for shamrock ribbon and was rushing as well. Teach me to be shopping during my lunch hour! :-\ I saw this and grabbed it. When I got to the register, the clerk said something about more in the bin. I said something about just wanting that one. It was from the $1 bin so I was kinda perturbed that she was asking me to purchase more. :-\ I just couldn't understand that. I was rushing and really to be honest did not hear exactly what she said and I wasn't looking to chit chat! lol Teach me to be rude too! So anyway... I get home... and I discovered it was ONE shoelace. lol Well, what am I gonna do with ONE shoelace. 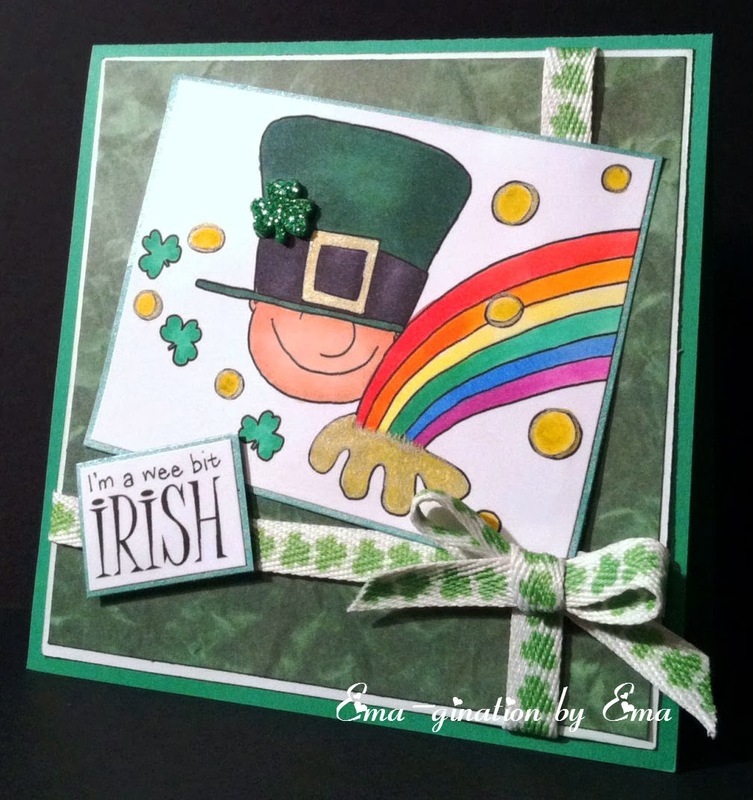 I'm gonna use it as a ribbon on a St. Patty's card that's what I'm gonna do! lol So there you have it... enough of my long-winded stories. I am a follower of these blogs and I display my badges and/or challenge links here. Cute card & LOVE that it was a freebie! I too love deals!! I like your shoelace story, it works perfectly for ribbon. GREAT job on the coloring. =) Thank you for joining us at Get Inky! Challenge. Lovely card. Thank you for joining the challenge at Craftitude. Freebies are the best! Cute card, thank you for playing along with Catch the Bug this week! What a great project, very cute!! Thanks so much for joining us for our March Theme “Feeling Lucky” Challenge at Catch the Bug, I hope you join us again very soon. I love the rainbow and that gorgeous ribbon! Thanks for playing along in our LUCKY challenge at Bugaboo Stamps! Good luck in the draw - and remember to stop by later to check if you're a winner. Hope to see you again in our next challenge too - it's going to be a fun one! Love what you have done with the freebie - thanks for joining us at the Just Some Lines Challenge!